These references make clear enough the crisis which led to the creation of two mass graves in the days immediately after the disaster. There were references to planting trees in the cemetery and general beautification efforts later in 1907, but I have so far not seen any specific references to the trenches/graves until January 1908. I also have not yet found the letter possibly printed in the Gleaner in late 1907 raising the issue of the future of those graves. May be something will turn up. DAILY GLEANER, TUESDAY, JUNE 1, 1909. Earthquake Victims Buried at May Pen. Attempt to Materialize a Chain Of Human Thought. It has already been announced in the Gleaner that the Memorial at May Pen Cemetery will be unveiled to-morrow (Wednesday) at 5 p.m. and it is hoped that a large and representative gathering of the citizens of Kingston will be present. We wish to-day to say a few words about the monument itself, and the import of the unveiling ceremony, as we think there is food for thought in the occasion, especially when the circumstances that led up to it are called to memory. In the first place it may not occur to everybody that the erection of a monument is in itself a matter of no small interest, being nothing less than an attempt to materialize a chain of human thought. One very apt to forget this, and yet the history of Art throughout the Ages is nothing more than the history of man's failure or success in this attempt. The great cause however of success of the greatest artists, whether painters or sculptors, architects or builders, was the fact that they had thoughts worth materialising. What thoughts then does this memorial express? The first is of course that which is recorded on the tablet at the base of the central column that it stands as a memorial to those of our fellow citizens who lost their lives in the great disaster, but we venture to think that it represents more than this. For the present generation it stands as a token of our heartfelt sympathy with those who lost friends and kinsfolk, but who themselves are still alive and amongst us, and when we assemble together to-morrow this must of necessity be the feeling uppermost in our minds. The column however will stand long after this generation has passed away, and the memorial is meant to bear to those who come after us a message and a warning from the past. It is to show them that we have realized the magnitude of the disaster, and learnt thereby a lesson which we do not wish them ever to forget. By its special construction it expresses our realization of the fact that to a great extent it was our own fault that so many lives were lost. Faulty design and bad workmanship have reaped their bitter reward and we have only paid the debt which Nature inevitably claims from those who disregard her laws. To an over-conservative critic the bare thought of concrete expressing an idea may seem monstrous and those who decided to use this construction were no doubt bold in their opinions that this should be attempted, but we think that a proper understanding of the work in its completed form will go a long way towards converting those who would have preferred to abide by the usual conventionalities rather than to attempt anything new. For ourselves we feel that anyone who sees the tall column gleaming white against the blue sky will not fail to be pleased with its appearance. The use of a column or spire to express a thought, a sentiment, is as old as art itself. It is the finger pointing upwards towards what is beyond, a token of hope for the ages yet to come. The long low walk that marks the place where the trenches were dug gives the scale of the disaster and the strong steel bars that lie within, all unseen, express the idea of preparation for trouble to come. Now and perhaps for centuries they lie inert, apparently useless, waiting and ready to be of service if another day of trial such as the 14th of January should come again. Emblems they are of a bitter lesson learnt, a firm resolve to be quietly prepared for trouble even if nature now seems to be asleep once more. The very shells which are used to make the outer covering tell a story of their own to any that can read the book of symbolism which is the book of all true art. They express the idea of perfection and beauty after the storm and stress of countless years of contact with the great forces of wind and sea. Each little piece perfect and beautiful although broken and apparently cast aside on nature's rubbish heap, the wild sea shore. If any such thoughts as these occur to minds on seeing the monument the money of those who subscribed and the time of those who carried out the work will not have been spent in vain. Memorial and inscription unveiled on June 2, 1909. First two paragraphs of the statement read by Bishop Collins for the Committee, at the unveiling of the Memorial. 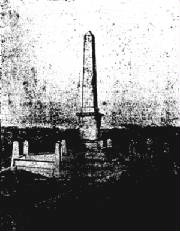 'The idea of a memorial over the graves of the unknown victims of the earthquake of January 14 1907, who had been hastily buried in trenches at the May Pen Cemetery, originated with Mr. John MacKenzie, the late Superintendent of the Cemetery. He spoke to a gentleman (Mr. A. B. Lindo) about the neglected state of the trenches; and this gentleman approached a representative of the Gleaner, The suggestion was carefully considered, and the Gleaner opened a fund for the erection of a suitable memorial. The public responded quickly and generously, and thanks to the assistance of a number of business men of the city who interested themselves in the movement, a sum of £378 5s 9d was collected. Over six thousand persons - certainly the largest gathering that has ever attended at the May Pen Cemetery on any one occasion - gathered there yesterday afternoon to witness the unveiling of the Memorial erected to the memory of those who perished in the earthquake and who were buried at the spot which the Obelisk marked. His Excellency the Governor attired in Windsor Uniform and accompanied by Lady Olivier, and Mr. Scott, His Grace the Archbishop of the West Indies, His Lordship Bishop Collins, S.J., Hon. 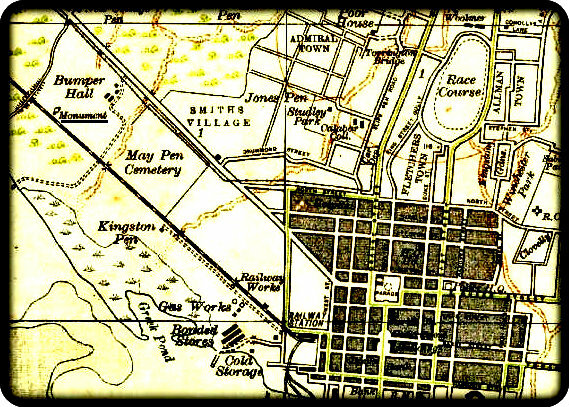 G. P. Myers, Mayor of Kingston and a number of clergymen, merchants, professional men and citizens were present. A force of police under the Deputy Inspector General, Sub-Inspectors Taylor and Palmer regulated the crowd, and they handled the big concourse of people splendidly. A large number of persons took advantage of going to the ceremony by the special train run by the railway authorities for the convenience of those attending, whilst the majority travelled up by road. The proceedings began with the singing of the hymn "O God Our help in Ages Past" led by the students of the Mico. Clarine Stephenson, Jamaican writer, leaving the Kingston railway station in February 1926, on her way to Spanish Town to view the ruins of the recently burned down old King's House. Just a footnote . . .
DAILY GLEANER, MONDAY, APRIL 29, 1912. We find that there has been an amount of £1 18s. 1d., at the Colonial Bank to the credit of the Gleaner Earthquake Memorial fund and we have transferred this amount to the Titanic Widows and Orphans fund.